Cass County takes an interest in time, nostalgia and the inherent heartbreak of aging, and what makes sense as a country song. A recent CBS Sunday Morning profile of Don Henley depicted him as a wealthy, successful man in search of something he can’t quite define, something related to his past, to the purity of childhood experiences. He’s buying up parts of his childhood town, he’s setting up a retirement farm with hopes of adding a cornfield like his dad had, so he can try and recapture the happiness of lying on his back in the cornfield, looking up at the sky. “I don’t think I’ve ever had a sense of well-being equal to that,” he says. 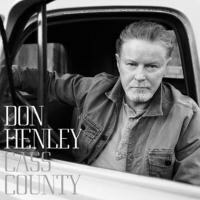 There are songs on Henley’s new album Cass County -- named after the county in Texas where he grew up -- that get at some of these feelings of longing for the past, though none capture the complicated feelings as well as the cornfield anecdote does. In fact, the songs more often try and argue against sentimentalizing the past. Some, like the closing “Where I Am Now”, project contentment and contrast his current happiness with the unsettled mind that’s always looking out for something better. Others, like “Take a Picture of This”, capture that bittersweet, looking-back feeling in a very Henley way (the tone that ruled his probably best album, 1989’s The End of the Innocence) and then destroy it, making walking away and never looking back the solution to the pain that comes with living. And then there are songs that take a more polemical approach towards that sort of mid-life (or later) crisis mentality. “No, Thank You”, for example, which sports one of the song’s most generic bar-band approaches, decries our hard times and the hypocrites trying to sell us a lie, but also tells us to “respectfully decline” living in the past. He sounds particularly like he’s turning down reunion tours and other similar offers; the song’s smug anger feels very much that of a celebrity protecting his brand, while proclaiming his hard-working, rooted-in-the-earth bonafides. It’s not always easy to parse out when the songs are reflecting the viewpoint of Henley the star, or Henley the artist, or Henley the man, and when he’s hitting on themes of home/memory/looking back to the simple life because they seem like the most appropriate topics for a country album. On the whole, Cass County takes an interest in time and nostalgia and the inherent heartbreak of aging and winds it up with a perception of country-music song format, of what makes sense as a country song. Or at least that’s what they seem to do, the reason they hew closely to some narrative tropes and cliches and a general literalness. There’s a song about a farmer praying for rain (“Praying for Rain”), one where a boy lays in bed listening to the train in the distance and imagining what’ll happen when he takes it and then (of course) does the same thing as a grown man (“Train in the Distance”), one about how sticks and stones break bones but “Words Can Break Your Heart”, a story song about the prototypical waitress/single mom who dreams of a better life and meets a man who might be able to give it to her, or maybe not (“Waiting Tables”), and a duet with Merle Haggard about how they take life as it comes and don’t dwell on memories (“The Cost of Living”). Country legends and rising stars abound on the album, as duet partners (Dolly Parton, Martina McBride, Miranda Lambert) or backing vocalists (Jamey Johnson, Trisha Yearwood, Ashley Monroe, Alison Krauss and several others). Henley and the Eagles of course have long been appreciated by and covered by country stars, and the group itself can be cleanly tied to the country genre if you want them to be. Some of Cass County’s best songs make his intentions to honor the genre explicit, like the rather gorgeous version of Billy Sherill’s “Too Far Gone”. “Gorgeous” too might apply to the Louvin Brothers cover that Dolly Parton joins Henley for, “When I Stop Dreaming”. The opening number, the Tift Merritt song “Bramble Rose”, fits in here too, as an example both of a song firmly in the genre and one where Henley sings well with others; in this case first Miranda Lambert and then Mick Jagger, whose appearance is a bit breathtaking in its precision and in how well Jagger projects his essential Jaggerness. The balance here between comforting tradition and old-hat cliches is continually shifting back and forth. At the album’s best, Henley conjures up the push-pull between restlessness and contentment in a way that jibes well with the musical interest in the traditions of the genre. At its worst, the album makes me want to throw it out the window, either for the cliches or more often the way the persona of the album comes from a lecturing place of “wisdom”; an I’ve-lived, so I know attitude. When I listen with extra attention to that attitude, conjuring up associations of Baby Boomer paternalism towards younger generation, it starts leaping out and smacking me in the face every few songs. I even start thinking Henley is acknowledging the way I’m listening and spitting back at me, egging me on and questioning my intentions. “You’re looking for a younger man / not me”, he sings about a lover, presumably, but perhaps also to me. There is a sense here of hey, I’ve been around, this is where I am now, I’m at the top of my world; if you don’t like it, feel free to get on that moving train and follow your dreams. Good luck with that. When you come back, unsatisfied, I’ll be here on the porch waiting for you. Or laying in the cornfield looking up at the clouds.